After adding a gallery to your website, you may want to make some changes to how it's displayed. Hover mouse over the gallery you want to change and click the wrench button. The Gallery Settings dialog appears, use the Layout to choose Collage or Thumbs. From the Gallery Settings dialog box, use the Source to choose Media Library or SmugMug. 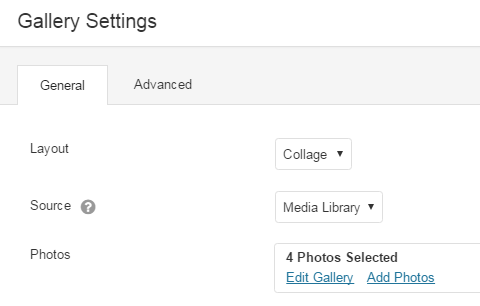 Media Library Click in Photos then choose Edit Gallery or Add Photos. SmugMug Insert SmugMug RSS into the Feed URL field. When Gallery Settings dialog box reappears, use the remaining fields as needed. Photo Size You can display your photos in 3 different sizes; large, medium and small. Photo Spacing You have the capability to space your photos in pixels. Show Captions You have three choices to display you photo captions; on hover, below the photo or not at all. Click Action Photo click actions available are Lightbox or Photo Link. Click Done, located on the top-right corner. Ascension Theme - Way to have multiple gallery pages?